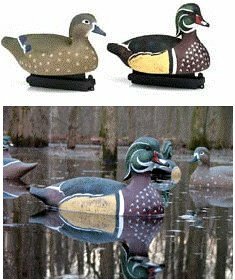 Lifesize WOOD Duck Decoys (AV73035) by Greenhead Gear GHG Avery Outdoors has lifelike detail at a great price. 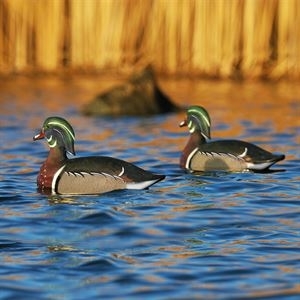 Lifesize WOOD Duck Decoys (AV73035) by Greenhead Gear GHG Avery Outdoors Outdoors gets birds attention from a distance! Avery Greenhead Gear Life Size Wood Ducks 6 Pack - 73035 GreenHead Gear 73035 These GHG Lifesize Series Wood Duck decoys are molded from original world-class carvings produced with intricate feather detail and anatomic perfection. After the meticulous true-to-life paint jobs are applied, the results are some of the most remarkably realistic decoys available today. The high-density polyethylene construction combines the best of both worlds -- incredible durability and lightweight carrying ease. Permanent GHG Dura-Keel weighted keels make these decoys ideal for use in a field or perimeter spread and ensure they self-right and ride flawlessly in the water.